options, calculator and so on. Very useful app! Thanks for your hard work. one thing: when I use the restart function it takes a while to excecute: up to half a minute?? Edited by Borix, 09 November 2012 - 09:54 PM. I got some free time and I have implemented the most requested feature - add a control panel item. Bug fixed: if you try to add a shortcut which is already in Win+X menu folder, then application will show you .NET framework error. New feature - "Add a Control Panel item" allows you to add any control panel applet including hidden like "Network Connections" or "All Tasks(God Mode)". "Add a program" now not a button but drop-down menu. One "problem": when I use the restart function it takes a while to exececute: up to half a minute?? Is immediate restart possible? Just like when I use the build in restart function. Edited by Borix, 12 November 2012 - 10:06 AM. No problem, its just different from the normal restart so I thought perhaps there was some way of tweaking it. New feature - "Add an Administrative Tools item" allows you to add any Administrative Tools item quickly and easy. 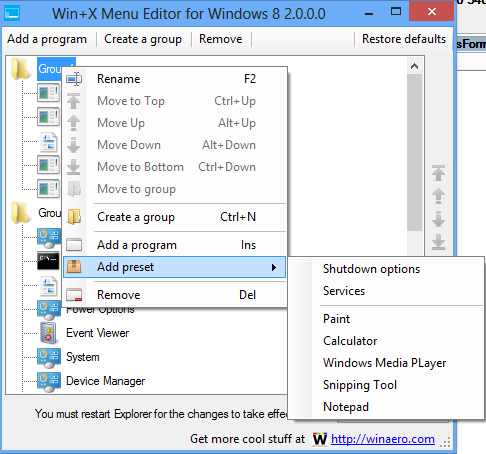 I like Win+X Menu Editor and have used it successfully on a number of PCs. However, I have had problems with the last 2 PCs...Dell Inspiron 15 laptop and Dell Inspiron 660s Desktop. On the first, after running this program to change the X menu, I found I couldn't access the C drive anymore. Everything stopped working. I could logon the PC, but not much else. After trying a number of things (system restore, refresh, reset), I finally cleared the partition with the OS on it and reinstalled it from a Windows 8 disk. Then I was able to run the editor without any problems on that PC. On this 2nd PC, I made sure I had a disk backup before trying to run the x menu editor. I'm running the 64bit version. It let me edit the menu and when I tried to restore explorer, it comes up with an unhandled exception...something about an access problem. I picked quit, rather then continue and got out of it. 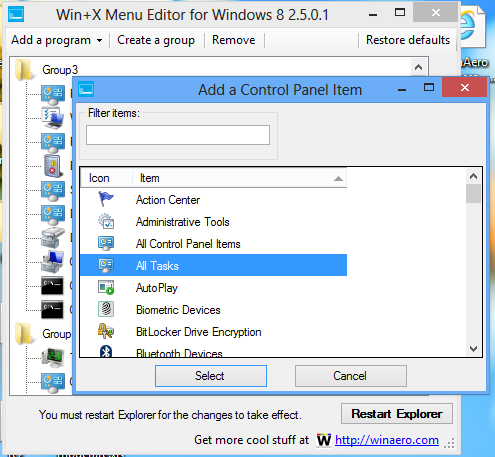 Now I notice that the administrative user I ran this under has the changes I made to the X menu, but another user I added to the PC has the default menu. So, on the 2nd PC, it seems as though there is something still not quite right, but I haven't had to reload the OS either. Any idea why I am having these problems? 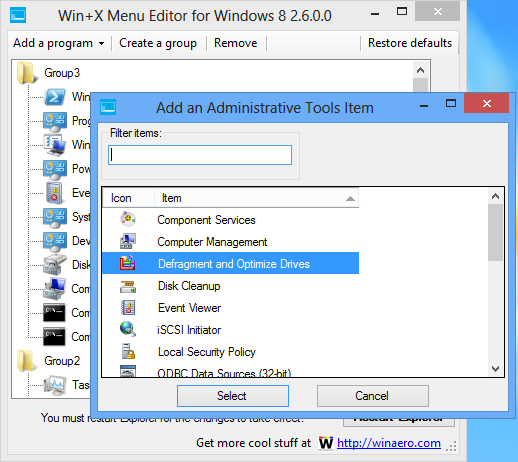 Starting with version 3.0, I eliminated separate versions for x64 and x86 Windows. From now, a single executable file can be used in both x64 and x86 editions. 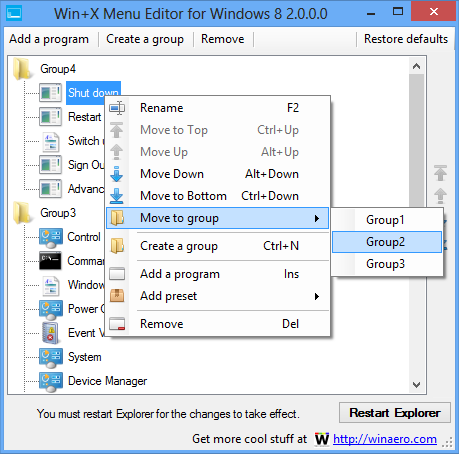 Win+X Menu Editor for Windows 10 and Windows 8 - contains app's description in detail and the full change log since its first release.